The most famous french book “Paris Tonkar” will be soon reedited. I wanted to know more about this project and interview one of the author of the third worlwide graffiti book: Tarek Ben Yakhlef. Tarek you are one of the authors of the most famous French graffiti book. How do you were connected with the graffiti and why did you choose to present this art on a book? Sorry for my English, but I’ll try answering clearly and explaining my story. Well, I discovered graffiti art in London subway during my first travel in this country in 1986. I was living in Brixton and the subway line near my house was fully painted by writers. I don’t remember which writers were in this area but I was very impressed by them style and it was for me the first time that I observed this kind of graffiti in subway. I was young in 1986 (15 years old) and for me graffiti wasn’t visible in subway. In Paris, after my journey in London (one week alone to discover the city and all subway’s line), I tried to do like English writers on my books and few times in my street. At the beginning, I was alone and after a few weeks with one of my friend, we practice in the subway (only a few times) and always more in the street. Three years later, I decided to write a book about this art because I need to speak on graffiti not like a graffiti writer but like an author. I love art and I need to write to feel good. So, I start to take pictures in French subway, on RER line, in city and suburbs with Sylvain Doriath who was a writer. With him, I met a lot of writers and after that the adventure of Paris Tonkar began ! My experience and my desire to write a book became the first French book on graffiti and first one in Europe. I was 19 years old. Could you please tell us about the graffiti scene at the beginning of the 90’s? In the 90’s in Paris and his suburb, you could find most of writers from the first generation like CTK (crime time kings) the Bando’ crew (he’s maybe the first writer in France), NTM, 93MC (93 mafia crew) with Kea, Swen, Fame (RIP), Kay and more, BBC (bad boy crew), Force Alpha, 156 with Jonone from New-York, FBI with Darco and Gawki, Artistes Urbains, TCG with Sheek, CAS, TBK, PCP and many othersÉ Between 1983 and 1988, the French scene was essentially in Paris and in suburb with the first generation like San, Ash, Jay, Spirit, Blitz, Bando, Steph, Colt, Boxer, Meo, Lookiss, Mode 2, Posh, Squat, Psy, Alp, etc… Most of them painted in downtown (Seine, Louvre, Beaubourg, Stalingrad…) and in subway, even if the trains where washed before they ran. In suburb, writers painted all RER lines and a lot of stations like Gare du Nord or the B line in south or Cergy line. The second generation started in the late 80’s with the Hip Hop movement. I was there in this period and I think this one was the most important because Old timers and a lot of writers of new generation where together to paint and to learn how to make it with a good style. Where were for you the most valuable writers at that time? A lot of them were valuable because you have many styles at that time. I like Steph and Meo’s pieces, Mode 2 characters, San and Bando’s letters and Jonone’s freestyle. And many others for one pieceÉ In Paris Tonkar, you can find a lot graffiti I regard as art. When you brought out this book, do you can imagine that it will become a reference 20 years later? Frankly no ! I knew that I was writing the third book about graffiti after the two of H. Chalfant but I never imagined that my book would be one of the references in the world. I’m very happy now and proud of this part of my life. You are making scenario for kids book now and you don’t publish any other graffiti book these last years. It seems that you are not in the scene anymore. Are you really out of scene now or are you still in touch with the new comers and the scene in general? In 1992 you start the bi-monthly magazine 1tox in collaboration with editions Florent Massot. You bring out 8 issues with the best of graffiti pieces of Paris . Could you please tell us about this second step in the graffiti edition? Few months after Paris Tonkar’s success and before Paris Graffiti (the first biggest exhibition of graffiti art in Paris in rue Chapon), Florent Massot, the editor, asked me if I could create a magazine who will speak about street art and Hip Hop culture. With Sylvain and others, we have worked on this concept and after a month we started to work on the first issue. I found the logo and Florent Massot the name, 1Tox. Concerning Paris Graffiti, I’ve found the concept and the poster. Why did you stop publishing 1tox? Honestly I don’t know because I’ve stopped to work on this magazine after the fourth issue. That’s life! I heard that you wanted to propose the 8 issues of the magazine via Internet? Yes, I’m preparing a numeric copy of this magazine and people possibly will consult on my page at Calameo website. These 8 issues will be available for free reading only. Let’. gets back to your book Paris Tonkar. Lots of rumor told that you are in contact with the co-author of the book Sylvain Doriath and that you wanted to republish the 200 pages of Paris Tonkar. Please tell us what are the current step of the discussion? It’s not a rumor but reality ! We have a discussion about reediting our book and now we are in negotiation with a lot of publishers all around the world for it. I’m preparing a new edition with more pictures, more texts, more writers and a lot surprises! You will add new content of unpublished pictures that you took at that time ? Whitout saying us too much, please give us some more info about the content? What kind of surprise? Yes, I’ve a lot pictures unpublished and very important for the early years of French graffiti scene. I can’t speak about the content but I can give you one important news : I’ve decided for this new edition to relate the history of French scene between 1983 to 1993 in Paris and suburb. Now, I’m discussing with over 200 writers and a part of them were not present in first edition like San or Chino. Sorry, but a surprise is a surprise! Do you will change the format? Last year, Martha Cooper and Henry Chalfant republished their world wide famous book Subway Art, renamed Subway Art 25th anniversary. Does this reedition of this book motivated you to start the discussion with Syvlain Doriath? No! Since 2008, I’m thinking about a new edition with another texts and more pictures because two teenagers wrote Paris Tonkar first edition. So, I’m a writer for ten years now and I can’t let it without shifting. A sort of rebirth after 13 years! For this new texts, do you collaborate with some writers present at that time? You planed a worldwide publishing, it takes lot of time. Do you have any idea when we can find the reedition on our favorite bookshop? Before writing all texts, I’m questioning all writers about our history and our experience. Concerning worldwide publishing of course yes, I’m discussing with publisher about it. 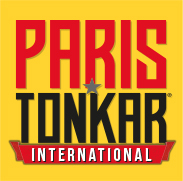 You can find Paris Tonkar in 2011 on our bookshop in France and I hope so in rest of the world. The Edition Florent Massot stop their activities in 1998 but they came back in 2006. will you republish the book with these company? No! Nowadays, Florent Massot is publishing only novels. He’s a good editor and I think that he doesn’t want to reedit my book. That’s the past for him! You want to reedit Paris Tonkar and you want to put 1tox on the Web. It seems that you are back to your first love? Yes, I’m back ! I will continue writing comic and children’s book but I want to publish graffiti’s book and I’m preparing Paris Tonkar’s magazine with a friend journalist, the editor of International Hip Hop… First issue in June 2010 ! Sylvain is preparing the Paris Tonkar’s website. June 2010? It’s tomorrow. Would it be a French magazine? Yes, for the beginning we can’t do a bilingual version because it’s more expensive for us. Maybe after or in a webzine? Actually, starting a magazine it’s quite dangerous. Some respected magazine in Europe stop their publishing. How will you manage to entertained your readers? We’ll offer a serious content to readers and many articles about street art, spraycan and subway art. Paris Tonkar’s history in European scene can help our magazine to resist at this crisis. I hope so! Maybe you can let us know the topics of the first issue? Now, I’m working on the content and I can say nothing. In a next interview maybe? So, You will have a busy day in the next week. I wish you lot of success for the launch of all these different projects.